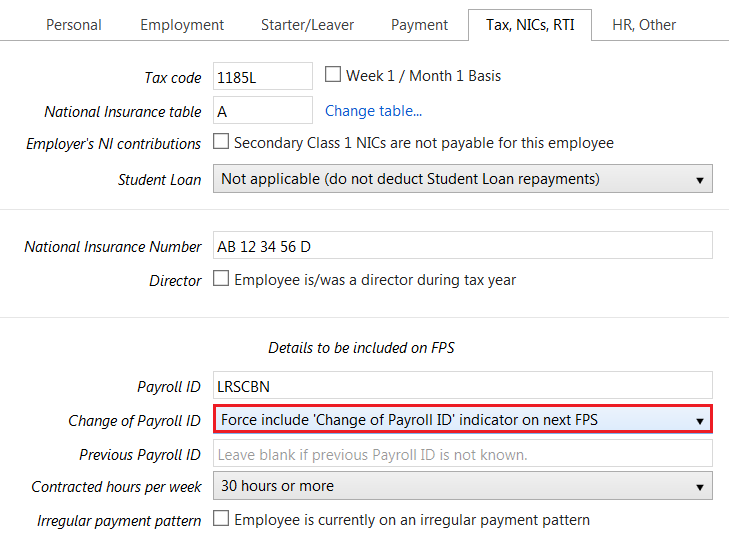 PLEASE NOTE: THIS IS ONE OF THE MOST IMPORTANT SECTIONS ON THE PAYROLL SOFTWARE. THE INFORMATION YOU ENTER FOR EACH EMPLOYEE WILL DETERMINE THE PAYE, NIC & STUDENT LOAN DEDUCTION THAT THEY WILL PAY DURING THE TAX YEAR. The payroll software will default to the tax code 1185L for tax year 18/19. Simply amend if a different tax code applies to the employee. If the employee is liable to Student Loan repayment deductions, select whether Plan 1 or Plan 2 student loan repayments apply. Enter a start date and stop date, if known. BrightPay will automatically deduct the amount according to the current Student Loan Deduction Tables in place. THE EMPLOYEE’S TAX, NICs, RTI DETAILS ARE NOW COMPLETE. NOW SELECT THE ‘HR, OTHER’ TAB TO CONTINUE TO SET UP THE EMPLOYEE’S RECORD.